Many animals use camouflage to blend into the environments where they live; matching the colors or patterns around them can help prey to stay safe from predators, and predators to be stealthy hunters. With this collage project we’re going to look at three animals that have adapted to blend into a wintery landscape: the polar bear, the snowy owl, and the Arctic fox. Even on a snowy day, lots of plant matter can be found in a wintery landscape, too. By making prints of the plants that we find, we’re going to use the wide variety of shapes and textures in the natural world to create a variety of patterns for the fur and feathers in our collages. 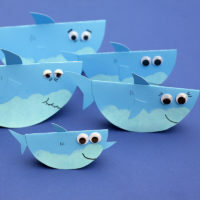 After we’ve made our prints, you’ll see how we can build the animals and their environments out of simple shapes. 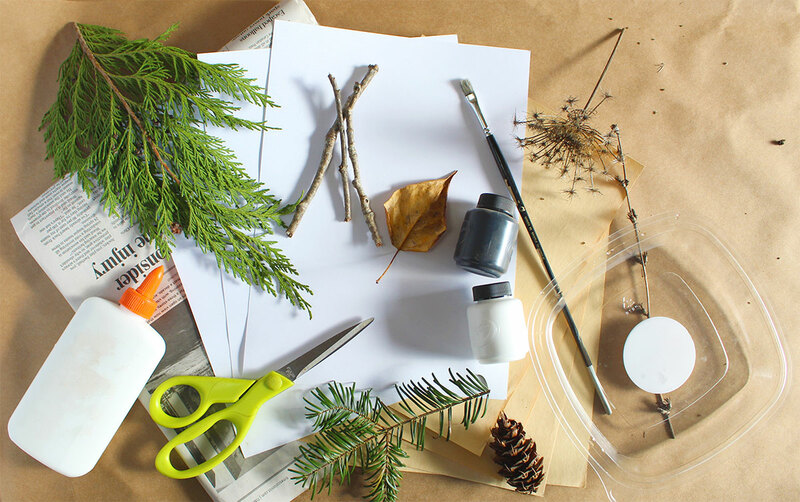 Plant material for printmaking – we used twigs, cedar and pine branches, leaves, pinecones, and some dried plants. Go for a walk and see what you can find! Step 1. Pour some white paint into the tray. 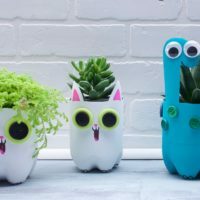 Dip your plant materials in the paint, then press them onto the cream paper; these will become the patterns for your animals’ coats. 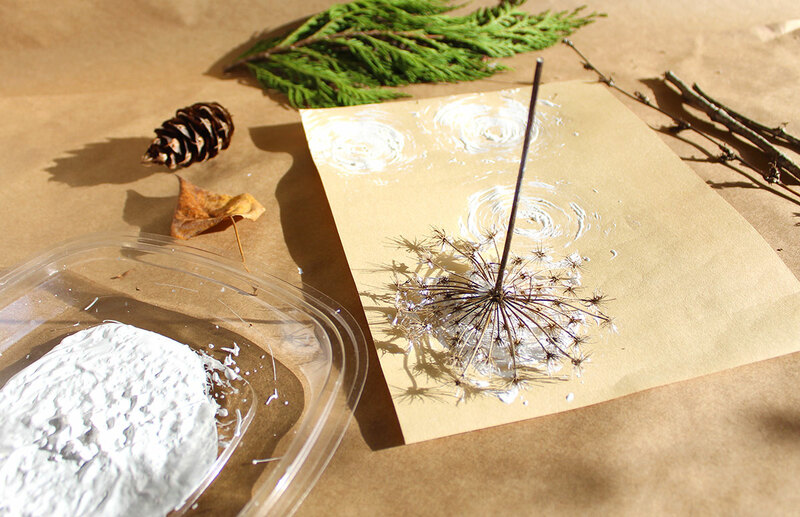 Try different mark-making techniques with the plants: you can roll them, spin them, and drag them along the paper. Polar bear: Cut out large, curved sections for snowdrifts and glue them to overlap with each other. 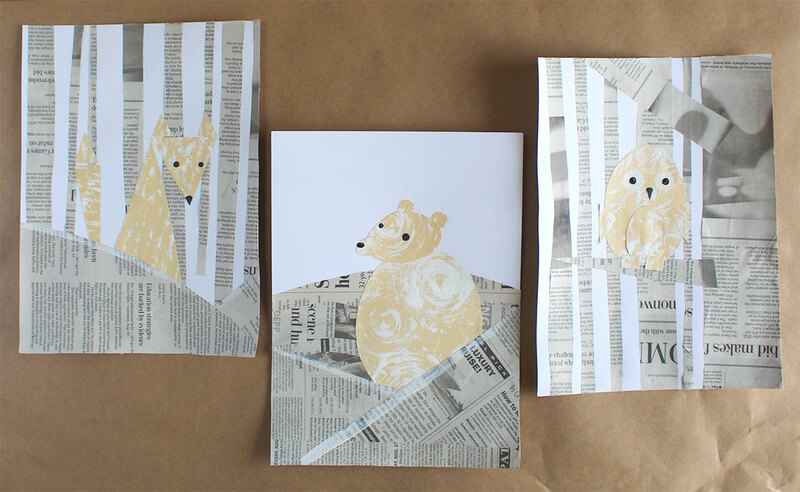 Cut two triangles and set them aside to go in front of the bear. 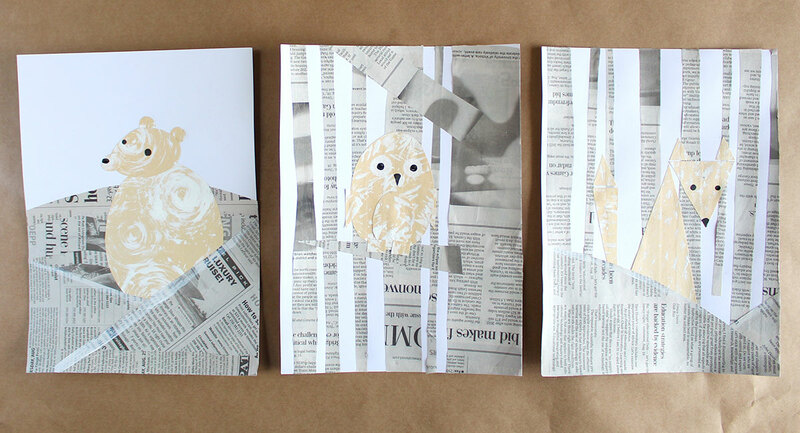 Snowy owl: Cut a thick strip of newsprint for the owl’s tree and several smaller strips for the background trees. 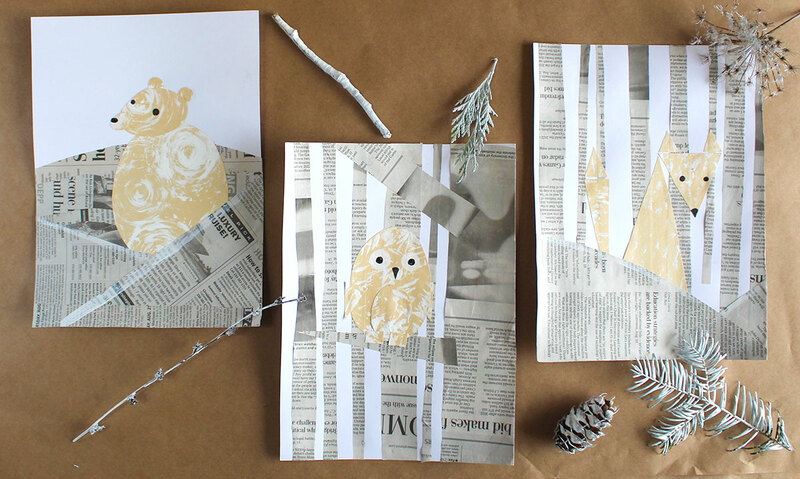 Glue the owl’s tree along one edge of the paper and the background trees next to it. 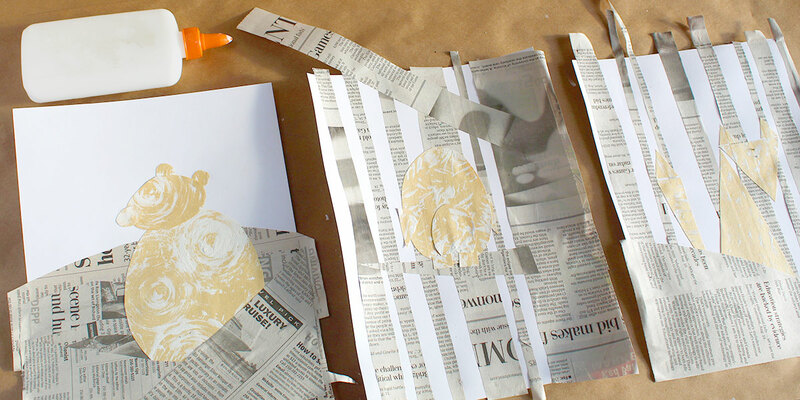 Cut and set aside a shorter strip and a long triangle for branches. 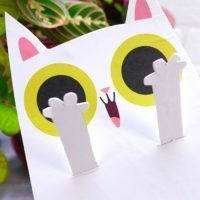 Arctic fox: Cut strips of varying thicknesses and glue them to the cardstock; try to glue the thinner strips higher up on the page to represent trees that are farther away. Cut two snowdrifts, as you did with the polar bear, and set them aside. Step 3. On the back of your patterned paper, pencil in the shapes shown. The polar bear is made of ovals and circles, the fox is made of triangles, and the owl is a combination of ovals for its body and belly, triangles for its wings, and rectangles for its feet. Step 4. 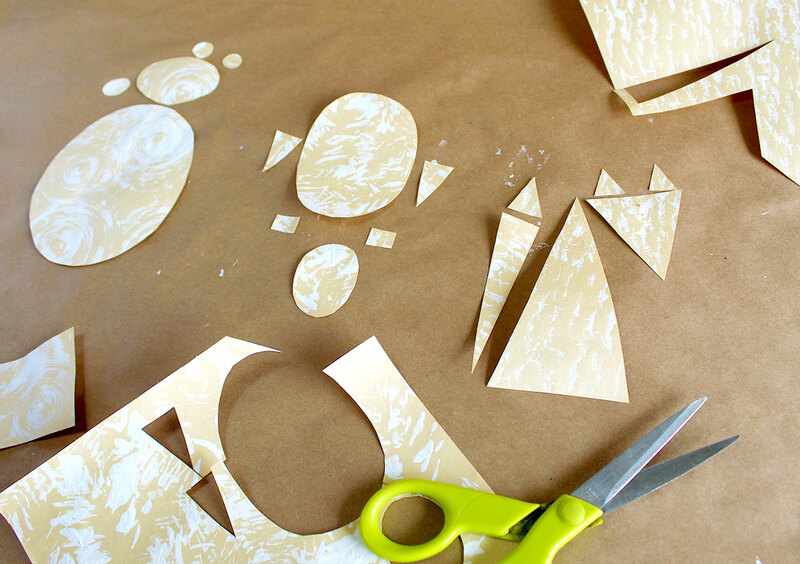 Glue down your animal shapes. Before gluing down the owl, add in the branches over top of the background trees. Add the remaining snowdrifts in front of the bear and the fox. 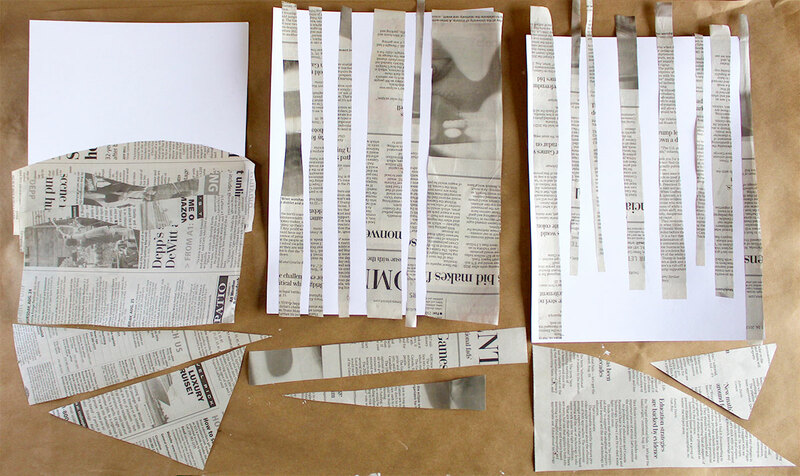 Trim away the extra newsprint around the edges. Step 5. Paint in the details! You can use white paint around the owl’s eyes and along the edges of the front snowdrifts to make them pop forward, and black paint for eyes, beaks, and noses.